Obituary for Joseph Salvatore Malone | Doolittle Funeral Service, Inc.
Joseph Salvatore Malone, 55, of Pensacola, Florida, husband of Michele (Odiam) Malone, passed away surrounded by his family while traveling in Australia after a short battle with ALS. Born in Middletown, he was the son of Linda (Watanabe) and Mark Gumkowski of Middletown and the late Joseph S. Malone. Joe lived in Middletown most of his life and graduated Woodrow Wilson High School in 1982. He moved to Pensacola, Florida in 2007. 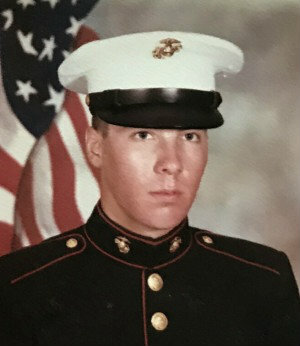 He served in the United States Marine Corp for four years. Before and after the Marines, Joe worked in management for Reliance, one of his best friend’s family business. Joe loved traveling and especially cooking where he went on to graduate from Culinary School. Joe was also a huge animal lover and rescued many pets over the years, including his current fur babies Mouse, Kiki and Matilda. Along with his wife and mother, Joe is survived by his sister, Lisa Taylor and her husband, Mark of East Haddam; a niece Emma Taylor; a nephew, Adam Taylor; mother-in-law, Penny “Mum” Odiam of Perth, Australia; two step sons, Andrew Larson and Patrick Larson (Haley) and a step daughter, Nicole Brooks (Matt), all of Pensacola, FL and many special aunts, uncles, cousins and friends. Funeral services will be held on Saturday, September 8 at 10:00 am at South Congregational Church, 9 Pleasant Street, Middletown. Burial will follow in Saint Sebastian Cemetery where full military honors will be accorded. In lieu of flowers, Donations in Joe’s memory may be made to ALS Association, Connecticut Chapter, 4 Oxford Road, Unit D4, Milford, CT 06460 or to the charity of the donor’s choice. To share memories or send condolences to the family, please visit www.doolittlefuneralservice.com.